Why I read this book in French, I'm not sure - it's a translation from the English. I must have read about it in a French magazine, got a sample onto my Kindle without checking what the original title was, forgot about it for a few months, and then decided to give it a try while we were on holidays. It's an entertaining little book, not very deep - It's told from the perspective of a Pakistani socialite, who is helping her aunt find a bride for her son (the aunt's son). She is wealthy, has a good husband, many rich friends, a good social life in the right circles, but she is sooo shallow! And she is not as well educated as she would like to think! Her malapropisms are very funny! 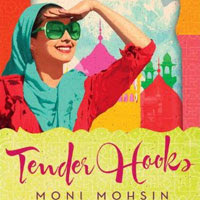 I think the character developed by Moni Mohsin may be Pakistan's answer to Ross O'Carroll Kelly - hilarious if you understand all the context and colloquial undertones, but only mildly amusing if you don't, or if, like me, you don't have a sense of humour. And in case you'd like to read it, the English title is Tender Hooks. I'm now well into my summer reads - between a week's holiday in Donegal and a couple of weeks of decent weather here in Dublin, I've been through a few books. Some better than others. But I can always rely on Philippa Gregory for a good Tudor read! The Queen's Fool follows Hannah Green, a young girl whose mother was burnt at the stake in Spain, for being a hidden Jew. Hannah and her father, a printer and book seller, managed to escape to England. Hannah has "the Sight", like a few of Philippa Gregory's heroines, and ends up in the service of Queen Mary, the first daughter of Henry VIII, by Catherine of Aragon, who was divorced by the King for Anne Boleyn, mother of Princess Elizabeth. At this point in my reading life, between Philippa Gregory and Hilary Mantel, I have a fair knowledge of the events and key players of Tudor England. But I didn't know what had happened to Mary. There is no big movie or opera about her, is there? Well, I guess that England did its best to forget her, except through the name of drink. Yes, a lot of blood was shed during her reign. 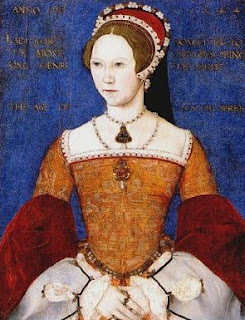 She was a Catholic Queen and she spent her life on the throne trying to bring England back to its Catholic roots, as she saw them. All pretty heavy stuff. But not when you're learning history through the eyes of a young girl at court who is spending her life pulled between the two half-sisters plotting and fighting for the future they believe is best for their country. I'm now onto the next book, The Queen's Lover. Not quite as engaging so far, but it's early days yet. Make sure to have a look at Philippa Gregory's revamped website - it's really nicely laid out as a timeline. She's quite a prolific writer, isn't she? If a close-up of a fern is not enough for you, here is a view of the Glenveagh National Park. We didn't see any eagles in Glenveagh National Park. Apparently, there is only one pair there, despite all the fuss that was made about re-introducing eagles to Ireland - farmers didn't like it, and they poisoned them. Crazy, isn't it? But that's what happened. That's the kind of country Ireland is, I'm afraid - on the one hand so proud of its beautiful environment, and on the other quite willing to destroy that environment for profit. But we did see strange ferns - at least I think they're ferns. 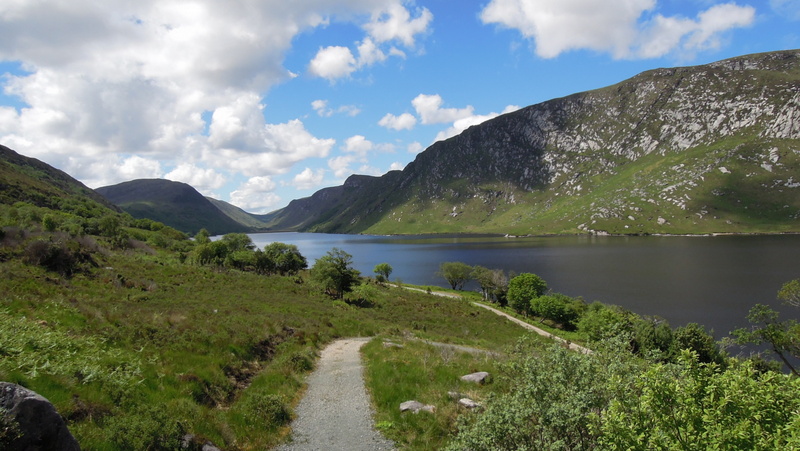 If you're in the area, eagles or no eagles, Glenveagh National Park is a must see - and the chocolate cake in the tea rooms is to die for (if you don't mind butter, that is). I had seen Evelyn's new hairstyle a couple of weeks ago, but didn't get around to capturing it for you. At first, it looks like Evelyn got her hair cut - and I think it suits her. When she turns sideways, her hair is up actually, which is not so flattering - my opinion only! I think the shorter style is absolutely gorgeous on her. If she's thinking about getting her hair cut, I'll say, yes, go for it. It's lovely! So many lovely views of Slieve League, it's hard to choose. BB sent me this little video this morning. Star Trek is all coming true. When I told him we were going to one of the highest cliffs in Europe, my brother asked me about the geology of Slieve League - "I have no idea" was my reply. But I did take a picture at the back of the mountain - it still doesn't help me, but I'm sure he'll know what those black and white rocks are. 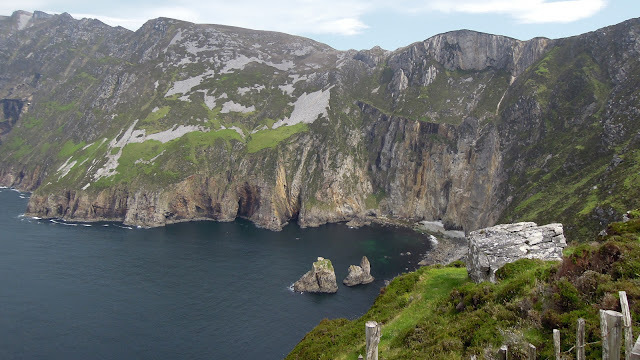 If you're really keen about the geology, you may be interested in this little article I came across - apparently Slieve League is connected to the Appalachian mountains, from a long long time ago before the Atlantic ocean separated them! Isn't that fascinating! I always loved my plate tectonics! dominant rock type is the Slieve Tooey Quartzite (of which both Slieve League and the neighbouring Slieve Tooey are constructed). It is a fairly pure quartzite formed in the shallow waters of the continental margin of Rodinia. Below the quartzite lies the Glencolumbkille Limestone, a unit of carbonate sediments deposited in the warm seas of Rodinia, now metamorphosed to marble. " Much higher than the cliffs of Moher. One of the highest cliffs in Europe. So high that it's hard to take it all in. And yet, no busloads of tourists or interpretive centers. That is one of the beauties of Slieve League in County Donegal. The only thing that's missing from my perspective is something man-made at the bottom to give you scale - you just don't realise how big they are. The last time I was in Donegal was over 20 years ago - and I did go to Slieve League that time too, but the weather wasn't as clear as last week - it was a typically wet and windy Paddy's Day weekend and I stayed with a number of friends in a cottage on the bog near Glenties. I don't remember much - a nice pub with a fire in Killybegs, falling on sheep poo over Slieve League (I was wearing a cream coat! ), going to Nancy's bar, where there was music going all night, and the vast expanse of bogland after crossing the border from Northern Ireland. My memories from this holiday are very different - sunshine most of the time, beautiful beaches, good road, excellent food. Things have changed a lot in 20 years - or am I just getting older? I put together this little art journal page during the June bank holiday weekend - it was really easy: acrylic paint applied with an old credit card, circles made with a plastic cup, and acrylic+flexible modelling paste pushed through an alphabet stencil. Some days it's good to wake up at 5 am! This was the view from our bedroom at Arnold's Hotel in Dunfanaghy. Thankfully, I was able to fall back to sleep, after taking about a dozen photos. (This one was taken by BB). With only the slightest of boost from Picasa! I did take over 600 photos, be warned! Donegal has got lots of quaint little harbours, majestic beaches, peninsulas and sea views. Expect plenty more of these types of photos over the next couple of weeks! On our way to Slieve League (lovely smoked mackerel salad, and chocolate cake to die for at the Ti Linn café by the way, well worth a stop), we went through the town of Carrick. We stopped at the pier at low tide. This definitely falls into the category of "Things you don't see at home every day". We stopped for lunch in Carrick-on-Shannon on the way to Donegal - we had our little brento on a lovely pontoon by the water. The sun was shining and it was a perfect day. This photo might help me in figuring out the painting I was working on before our holidays. So many ideas, but how to execute them? And by the way, the water lilies in Sydney were so exuberant that you could not see the water under them, so I think I 'll have to give them a miss. They were a nice shape, and there were even a few photogenic pink flowers. Maybe for another project? So I'll start with some seaweed from Mullaghmore in County Sligo - a beautiful beach, impressive scenery all around, some of the highest waves in the country for surfer dudes - thankfully no big waves the day we were there, the last of this year's hot spell - was the first week of June 2013 the start and finish of our summer? We only stopped there for an hour or so, on our way to the shores of Lough Eske, but it is a place I would like to revisit some time. Maybe on a cold and stormy winter's day. I have a couple of pictures of water lilies I took at the botanic gardens a few weeks ago, and I was planning to paint them, but I realise now that their shape will not work in a painting - they're too curled up, and the open ones were not in a composition that's pleasing to the eye - I know, I know, I can re-arrange them in the painting. Then, I came upon a photo I took in Airfield before they were closed for their renovation project. It popped up on our photoframe, amongst 500 other photos - What are the chances?? The water itself is a bit dull, but I have no problem jazzing it up. So I've been playing with colours and composition and textures - we're not there yet, but there is nothing I love more than planning a painting - often my sketches and colour samples are better than the final product, and I enjoy the process so much. So here is where I am right now. 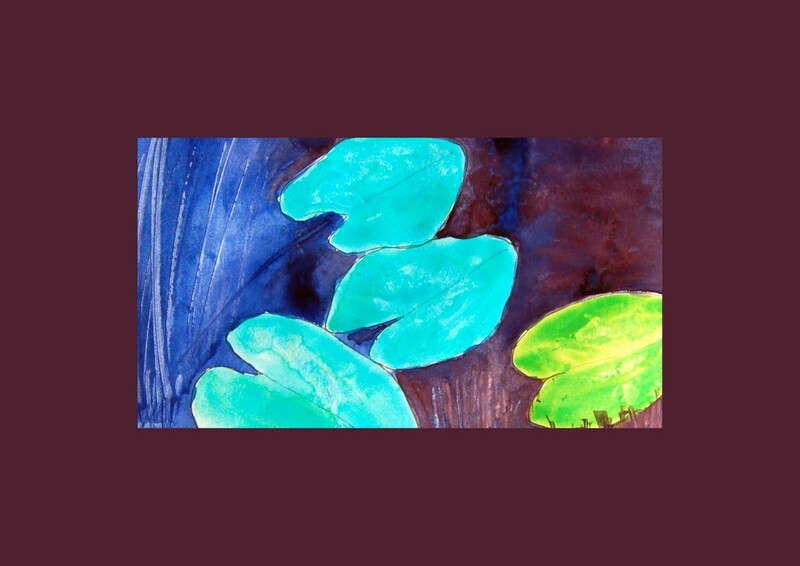 This is a little thumbnail done in one of my sketchbooks - I need to paint the water lilies a touch greener I think. And I need to decide if I'm going to go for high texture or clear washes. I'm leaning towards textures right now - heavily influenced that I am by one of Shirley Trevena's books - she never leaves much space with a plain wash. And the turquoise colour is inspired by her style too. Aah, I just remember we have some good photos of a water lily pond in Sydney botanic gardens - I'm off to look for them now - I think they are on an external drive, with thousands of other photos. At least I remember what year we were there, so I should be able to narrow it down fairly quickly!